If you see yourself as a serious Feng Shui student, certainly if you have been teaching 9 Stars and Luoshu in any shape or form, you want to be sure you’re as close as can be to what the ancient scholars had in mind. No games, meaning, there should be no fiddling anywhere in metaphysics. Yet, if then we did some thinking outside the box, what about the notion of external and internal in Feng Shui or Chinese astrology? Yes, you’re reading good, as for once it didn’t say interior or exterior Feng Shui in regard to house divination. I once received a question by someone whom at the time was working on an article, inquiring after what would be the meaning of Feng Shui outside the common translation Wind and Water. As I am no Sinologist, I still thought the matter interesting enough to share it with you here and extend a bit more into the Mountain, Water and Wind of it, because I took my answer a bit beyond just linguistics. What in Feng Shui is external and thereby exogenous, and what might just have been made to appear as such, but would be actually internal and endogenous. Also, while we’re at it, let’s look a bit into the intrinsic meaning behind some of those wondrous Chinese characters. I hope I am here finding you ready to doing some rather extensive reading on a number of topics, however, which if taken together, I hope will inspire you even more at what must be the finest of studies, Oriental metaphysics. As you’d apply Feng Shui, certainly as you take your knowledge to benefit others, you would be interested in what originally the ancient scholar had to say, yes? A bit less so would you like to find that you had been taken for a ride, or even lured into what might have become of metaphysics but after the ’emperor’ had laid his hands on the astronomy of it, to then filter the original teaching, so it got presented to the public in a pretty much deformed way. But, we’ll get to the ’emperor’ of it a bit later on. As we would here first go into some linguistics, we may then further propose how by default the ancient master might have transmitted the scientific knowledge, but not after he had altered the original teaching. 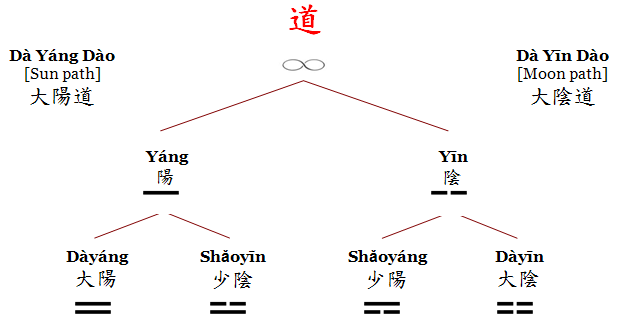 As a practitioner, it is good therefore, if you think and rethink any of those basic tools, then any of the application derived from it, because Hetu Yellow River map, Xian Tian Gua – or Former Heaven Trigram setting –, Fuxi, Wuxing have been not exempt from this. Your adventure into Feng Shui can only become even greater once you saw the true underlying teaching under those chewed on fabrications and you’d have much greater esteem for those ancient scholars, perhaps much less so for the ’emperor’. 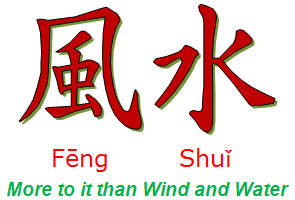 We have seen that, so let’s just skip how then Fēng Shuǐ – 風水 – literally translates as Wind (Feng) and Water (Shui). But Chinese wouldn’t be Chinese if not it got to a bit more appealing than perhaps suggested by just its square translations, as we’d often see a figurative connotation outside just sheer linguistics. Let’s see if Chinese is just a common language or an energy system, as goes for the Japanese language, as you may appreciate even better once you look up Kotodama on your next web search. As we’d be entering the world of sound and while at it, you might just wish to read the web on Solfeggio Frequencies, more in particular as you read on account of 528hz. Wenlin returns this on the Chinese character for Wind: “The scholastic commentator says that the wind produces the insects. In the simple form 风, the inner part is abbreviated to 乂, two strokes Yì – 乂 – which means to regulate, put in order, stabilize and viewed as some kind of scissors. Shuǐ – 水 – then translates as water or waterways. The unceasing flow of 水 water veins in the earth. Picture of water flowing. Compare 川 chuān, also sometimes written 巛 as a component in other characters, for example where it appears in jiǔ – or wine – 酒. Also compare 永 yǒng, meaning perpetually; forever; always. It is still about translating Fēng as Wind, but within context, could you visually take this image as a depiction for ‘mountain’? Even though it derives from the character for Wind, can you appreciate its intrinsic ability to block? See, that’s the thing with Chinese characters, as you can fly through and go around them until you experience their fiery and ever changing nature from within. When still in my martial arts time, I once had a beautiful calligraphy done for my dojo by a Japanese master. She showed me one way of how Chinese characters can be perceived and she asked me to imagine looking at a clear blue sky, then white clouds appearing in the sky, taking their swirling shape and changing form all the time. What Guo Pu had put there is more than what would be suggested by just the words. Then, Water is H2O but by extension it is also Yang energy, moving energy, carrying life, as it is to depict the retaining principle. Of course, within context of Feng Shui, above phrase would immediately pull your attention towards exogenous factors and chances are, the author knew this all too well and so it was intended. I need you to ponder on above phrase and replace the nouns if you have to. But anyway, what can disperse, can be blocked. What can flow, can be guided and retained, or held in position. As a matter of speaking, Wind and Water may be viewed as the same principle, by which water is just wind in motion, as neither would seem to keep to pre-set directions and are in that sense either one unpredictable. Both wind and water can go places, as also, both wind and water imply the ability to block or to contain. Both wind and water have the capacity to transport, be that insects or boats and to bring in either favorable or malign influence to where we live. It is implied that, if something can ride with the wind, it can be also obstructed or blocked, so Feng – besides wind – may be otherwise and on a deeper level taken to imply a blocking function, in this sense, and as an extension, Feng as compared to Shui would have assumed the figurative and poetic function of having become Mountain. These are the Chinese characters to our school’s name in the Netherlands, which reads Heluo Qi Xue 賀洛氣學. Although Xue can be taken to mean study and so as to further emphasize the ever evolving studies we partake in as a research center for professional Feng Shui, 9 Star Ki Divination, Nine Star Ki Astrology and the Chinese astrology Four Pillars of Destiny Bazi, I then took Xue to the rather more flexible Heluo Qi Explorations. If then you look at the Chinese character for Qì 氣 (pronounced Ki in Japanese), we will be discussing it further down, as well as we’d look into what may be one of those neat messages laying obscured in the character for Dào 道. Then on to the question, to what extent have you been indiscriminately applying the techniques just the same way as they had been earlier presented to you through books or in class? Do you find yourself offering advise to others, while transmitting all these goodies you had picked up some place before with respect to ‘this Mountain Dragon does this and you should do this’ or ‘if you’ll use water on this Water Star, then…’? We say, if what started a thesis was wrong hypothesis, then, whatever follows would be at fault. Welcome to the world that may just have us proceed from assessment, over supposition, then onto active statement, then into sure looping. If you went out to eat in a restaurant, it would be good if you knew from what kitchen the food originated and to know who’s the chef. It is no different in all of your studies and practice, while here it doesn’t matter if then it was science or metaphysics you’re into, much less would it matter from what region your study had come. Whereas Feng Shui would soon regard Mountain as those environmental elevations and Water as environmental H2O, we can also see how virtually all in Oriental metaphysics would be the ancient scholar’s way to present us with just a ‘fold out’, but of whatever he had first established to lie within the realm of our physical body and our physiology. It is the old story of the finger pointing to the Moon, so that, before we’d go into application anywhere in metaphysics to mind matters concerning health and fate, we need take what the ancients – then our teacher – had presented, then see if it might perhaps be a dress up for something else, then mold it back to arrive at its original shape. If not, your client still asking you about the moon, while before long you’d be going into deliberations about his finger joints. Again said differently, no astronomical principle being laid bare, or it would find its immediate sustainment in whatever we find on this planet, starting with our physical bodies, what it contains and all of its physiological functions. No observation of natural phenomena in physics done by the ancients, or it would be equally mirrored somewhere at the realm of Human Qi, living tissue actually. No law of nature, or it would have its characteristics extended into the manifested occurrence, and again in the next phenomenon and once more in next object, which perhaps at the brain’s first glance would seem the latest acquired was just unrelated to the earlier occurrence, but still of course all happening from same ratio and geared by same machinery along eternal continuum. If the ancients knew this, it becomes easy to see how they would have had ways of their own to then alter the actual teaching and make it appear as a different form before bringing the technique to serve the public. Thing is, how far from the original astronomical or mathematical equation had the presentation been taken, before it was molded enough for someone to decide it was then fit for us to see. Commonly – and what if at some level this was done intentionally -, the notion of Mountain in Feng Shui would pull our attention towards something that extends out into the open, the environmental elevation, whereas it may just as well been taken to obscure what was internal. Same for Water and Wind. If then the ancient scientist thought to make ‘external’ what he had earlier found at the physiological tract, but for whatever reason he then decided not to immediately show it, what then do you presume would Mountain once more become after we restored Mountain in its original connotation and after once again we established ‘fold in’? In other words, how did the scholar take something that he had observed internally, to then commit ‘fold out’, so that this something was dressed up to occur as something external or environmental? Likewise, perhaps rather not more than an intelligible ‘fold out’ of some underlying notion that the ancients had decided to keep from becoming all too obvious, what then would you say was environmental water if once more made internal. Last but not least, and if made physiological, what would be Wind? Everything originates from Wu Ji – 無極 -, the Great Nothingness, the Great Void. From this Taiji – 太極 – is born, the Absolute World, the Ultimate Universe, the Extreme Pole. All then is Dao, all encompassing. To make itself manifest, Dao employs the forces of Yang 陽 and Yin 陰, so that Dao be manifest and be given hands and feet, so that visible and invisible phenomena come into motion in the Relative World, where all is governed by magnetism. The Binary Model of Creation shows us how Yang will not go anywhere without ensuring Yin was at its side. Yin will not go places without having consulted Yang. It is the world of two manifestations, Liǎngyí – 兩儀, rather not ‘opposites’, just happening all at the same time, at all times. If there is a plus pole, there is a minus pole. Once we affect one magnetic pole, we would have affected the other, so that Yin and Yang – and considerably long before we would further categorize into light and absence of light, gender, temperature, the notion of action and response or even further down the line of reasoning some of those philosophical or folkloristic notions -, become just mere magnetism. As always, there would be no Yang going on its path without taking Yin with it, and vice versa. Said differently, there wouldn’t be anything ‘external’ in Feng Shui if not at some other level it was to be mirrored by something ‘internal’ just the same. The ancients knew all about ‘swirl out’ and ‘swirl in’, but moreover, they were masters at letting you on to think that the cosmos was about the side of the card they had presented to you, while they would see something else on their side of the card. Feng and Shui are like the outer side and inner side of a t-shirt. You would not tell people: “I am wearing the outside of the t-shirt”, as it is assumed by all that you were just wearing a t-shirt. Feng and Shui are just like Liver and Gallbladder which would be perceived by Traditional Chinese Medicine (TCM) as just one organ system. Compare this to anatomy where – just as we say is true for Yin and Yang – the Triceps and Biceps are not opposites, but antagonistic-complementary. Just as in martial arts we’d attempt to have action and response fall in the same moment, preferably without thought to still intervene anywhere, all in our universe will be at forever Push Hands. The notion of 5 Yellow for magnetic pole reversal shows us all at the realm of expansion and contraction happens just simultaneously. Also in Flying Star Feng Shui and apart from working with Real Mountain and Virtual Mountain or Real Water and Virtual Water and saying that ‘Mountain is good for People’, “Water is good for Wealth”, sometimes Water can be “Good for People” also. If we have water flow in from an elevation, the water would have been carried from out of higher altitude and therefore charged with mountain energy. Mostly, water from the mountain would be fresh and uncontaminated, so beneficial to health. So, there is always the obvious Yang-Yin in a phenomenon and by reversal also the intrinsic Yin-Yang. The so-called male-female principle in Yin and Yang has not been about actual gender, as people are like t-shirts also, just wearing one magnetic pole more to the inside, carrying the other pole more to the outside. We may appreciate how virtually all in Oriental Metaphysics has an actual and an implied connotation, by which the notion of paradox in all that is presented is critical, especially your capacity not only to recognize but also to accept and learn to work with paradox. I have seen many to voice their confusion over the many contradictory teachings put forward in Flying Star Feng Shui, or better still where they feel Feng Shui would seem to diversify into so many factions and ever so many paradigms put forward by what would seem an ever growing army of teachers and Feng Shui masters. We may establish that, in fact, by way of such perceived contradiction and the confusion to go with it, many have been lost for the field or at best, those with a training history wouldn’t have an idea where to still turn for sustained studies. But thing is, there is no contradiction anywhere in Oriental metaphysics, and paradox is not contradiction but just seeming – and at one point intended – contradiction, put there deliberately and for certain purpose. At the same time, if one source told you one thing about a system, while another source tells you differently about the system, then there might still be no contradiction as such deviation lies not with the system, but of course somehow human intervention got in. Mostly we can view Feng and Shui as two separate characters, by that as two separate entities. More precisely and doing justice to metaphysics, we could be writing not Feng Shui, but Fengshui, thereby understanding the continuum implied by the term Windwater, inviting us into dialectic-monism and spirallic thinking, rather than dualism and a linear type of thinking. Yin and Yang in their extremes produce the other pole, one implies the other and you will be struck by contradiction and the feeling to be at a loss, for as long as you’d find yourself caught inside here first supposition, then on to studying metaphysics but still not able to perceive from the second one. See what happens if you asked the first supposition to accept 1 + 1 = 2, then solve 1 + 1 = 3 from same. Confusion in our Qi studies may occur, where the brain might have a hard time accepting that within context, Y may be as good an outcome as C. In fact, if I was a scholar and I wanted to protect my cosmological findings, chances are I would take my initial observation and mold it into diagrams, prose or what have you many times enough, until C apparently became Y, then I’d present Y to keep the audience busy and have them juggle for a while. One would hope that your every day student would be able to just trust that the actual teaching transmitted in class was now in the presented diagram, however, if still the initial notion not being corrected for and when later on the student becomes the next in line teacher, chances are the teaching and application would continue to move from same red herring, which are intended smoke screens and just the mere decoys we see so massively used in Feng Shui and Four Pillars of Destiny, or in the whole of Oriental metaphysics for that matter. So, linguistically Feng and Shui can be translated and understood rather one-dimensionally. When it comes to practising Feng Shui, one must learn to yet work one’s way through several layers more. Further down the road, we may attain even deeper layers of understanding, the practise now being added with cosmology, philosophy (for as long as myth, folklore and religion are being left out as, more than anything, these have been causing for ridicule, uneasing apprehension and damage to art, students and clients), a more profound understanding of and skill over its full inherent meanings and one may walk from the domain of just sheer expertise and being an analyst into the realm of ‘diviner’. We counter intangible Yang with the appropriated tangible Yin. We counter intangible Yin with the appropriated tangible Yang. As a life goal, it can be taken as having the Yang discipline and duty meet with the Yin softness and compassion. Qi is not in mere technique, rather Qi can be taken as a mentality. Thereby, Fengshui can be taken and applied as mere technique, some practitioners will be able to extend the principle in a way that the technique now becomes a way of life, incorporating Heaven-Man-Earth or Time-Action-Space. It is one thing to see what the ancient scholar had perhaps done in order to dress up the underlying technique, as I can accept there might still be good intent or some higher defensible purpose, whereas it is another thing to see what one would come up with for deliberate desintegration of population once able to unlock what exactly the devious ’emperor’ had done once having laid his hands on the astronomical findings. Today’s metaphysics will be saturated with this and most would have been still practising more of it than one would even care to know as even the notion of Five Elements as it has been applied through its supporting cycle and controlling cycle becomes suspect. The original teaching had been molded to appear as something else. This may be done intentionally by the scholar and here probably still well intended or done from some defensible purpose. This may be less so – to use an understatement – if such cover up was committed by the ’emperor’, which would increase mercilessness right up to surfacing just sheer cruelty and the chance – that’s diplomatic for ‘with a probability bordening on certainty’ – that this would have been done with sure desintegration of individuals, families, the population in mind, of course solely to greater glorification of the ruler. The original teaching had been molded into an otherwise fairly unrelated diagram, or it may have been taken into a poem which in order to decipher and trace back to its original teaching would be hardly doable and be taking decades if not someone at least hinted towards its solution. The original teaching had been reversed in order, or just only half the equation shown, where also two diagrams may be conjoined to appear as just one diagram, things supposed to be shown vertically now presented horizontally, or the deviation may be in obscuring the nature – or even the proclaimed effect – of the teaching. The latter meaning that, and a bit sobering perhaps, what the ’emperor’ may let you on to think was bad for you, would be exactly what would come to the immediate benefit (if now you decided to let go of the idea) of the emperor. By the same token, what you were let on to belief was to come to your benefit – and which may hit close to home as you may have been taken same to others for advice -, now turns out to be detrimental. As a result, a great bunch of fine people would no longer travel into their auspicious directions or they may have been instead thinking their inaupicious directions are beneficial. At the same time, a lot of people may wrongly feel they had not married the right spouse, while otherwise there should be no cause for such doubt. Or, many may assume all sorts of other things about their relationship, under instigation of a faulted system based in fabricated equations. This is short for saying, once the despot knew you were reliant of Oxygen, he would soon have the decrete out telling you it was a better idea if you gave up breathing altogether. Nothing about this is new and we all know that all too well. It may just be that we might have accustomed ourselves to being a bit suspicious on account of anything governmental, while failing to see the government in such arts aimed at ‘harmony’ and ‘balance’ as Feng Shui, 9 Star Ki or even the notion of Karma. Everything Oriental seems unsuspect, perhaps because we need it to be like that. We may think and rethink Mountain, Water and Wind and perhaps reconsider some of those standing and highly unsuspect techniques in Flying Star Feng Shui, e.g. the one to suggest that we ought to sleep with windows closed for purpose of health and we may gather new appreciation for what this would do – notwithstanding Mountain or Water Dragon, as we’ve been through that – eventually to our physiology, already if we’re alone in the room, not to speak of perhaps another person there too, competing for same Oxygen for a good number of hours, day in day out. There will be not much in metaphysics to give you exactly what it may seem. An example of this is in this Chinese coin. When asked to decribe a Chinese coin, most tend to describe a ‘circular coin with a square hole in the middle’. Well, you could still wear it around your pinky, but there is no hole. The coin is an intelligible design to represent the creation and unity of Heaven and Earth. Also, according to Five Transformations, a circle represents Metal and a square represents Earth. Along the Wuxing supporting cycle, Earth will engender Metal, thereby wealth. The Chinese coin is designed to attain a perfect representation of matter and energy, tangible and intangible, Yin and Yang, solid and void, but there’s only a seeming void at the center. Some say, the circle represents Heaven, while the square represents China. Note that the Chinese character for ‘China’ (Zhōngguó – 中國, or Middle Kingdom) includes a territorial square 囗 with walls and warriors 或 or (as in the Simplified version) a square holding 玉 (Yù – ‘jade’) in place of 或. There was a variant 囯 with 王 (Wáng) ‘King’ in the middle. If we extend Sāncái 三才, or the unification of Heaven, Man and Earth, you will enjoy how the Chinese character for Dao becomes an adventure in itself, as it is quite harmonious with twelve strokes and it is to store a special message. 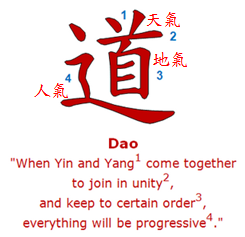 The two top strokes (1) say: ‘When Yin and Yang…”, then continued in the horizontal stroke (2) as “come together to join in unity..”, then 目(3) “and follow (or keep to) a certain order”, then the ideogram indicating movement and progression 辶 (4) “everything will be progressive”. We can relate this to several walks of life: “when husband and wife come together to join in unity and keep to certain order, the marriage will be prosperous”. To this respect, I’d like to think the character along with its intrinsic message can be viewed in close relation to what’s in Yi Jing Hexagram #37, which you may look up if you like. At the same time, this would have us contemplate the hidden purpose there has been in at all incorporating the Chinese Ming Gua 命卦 system ‘designed’ in the Tang Dynasty and so massively used in Ba Zhai 八宅派 Eight Mansions Feng Shui. Whereas most of it was a deliberate fabrication and Ba Zhai originally not a member of Xuan Kong Feng Shui (better still, San Yuan doctrine), the Ming Gua system still requires you to distinguish between ‘Gua’ for males and females born in the same Solar year. It may not become immediately apparent, how this would come diametrically opposed to said Yi Jing text and everything else we know in Ming Li 命理 or fate calculation. Then, gradually and even though we must keep 9 Star Ki and Ming Gua strictly apart, what would be one’s 9 Star Ki astrological birth Star got mixed up with what would be one’s Ming Gua and many would meanwhile no longer ‘identify’ with the former, but design their life along the latter. Whereas in a way we may say you ‘are’ your 9 Ki Star, you ‘are not’ your Ming Gua. While the two come as perfectly unrelated, still many will be referring to ‘their type’ by interchangeably using ‘my Gua’ and ‘my 9 Ki Star’. Try find different astrology signs for males and females leading to different horoscopes, different astrological character descriptions, different relationship compatibility or date selection anywhere in Western astrology or different archetypes along numerology. You won’t be able to. Of course, such can be only meant to further interfere with our personal frequencies, or our innate magnetism if you will, and will come as ultimate and deliberate desintegration of families. In the mean time, especially so if you’d be employing on behalf of women, if you have been employing the Ming Gua system for purpose of Feng Shui and house divination, compatibility astrology, directionology, date selection, Yi Jing Divination or fate calculation, that’s just fine, but chances are you’d soon be mixing apples and oranges if not you stepped into 9 Ki for annual-, monthly- and daily Stars when so required. You may wish to set yourself behind your desk and reserve some time for research and to seriously set yourself to applying 9 Stars and Luoshu Divination by its original form and see if the ‘different Gua’ for females holds true. As always in metaphysics, you wouldn’t be taking anything from anyone, but would you concur it is a bit easier to accept a forecasting once the event was to be actually mirrored by your annual- and monthly Luoshu? No humans to interfere there, just you and Luoshu. I bet you would agree that this beats whatever then anyone had to say on the subject. As a rewarding exercise – and one you could finalize today, or tomorrow at the latest -, you could try look into accidents or missing persons cases in your media involving females and see for yourself whether the event was matched by looking at the ‘Ming Gua’ or if the Magic Square reveals the story to you only once you’d incorporate 9 Stars just as would be suggested by Nine Star Ki Astrology. If you think this is confusing, that’s understandable, but you could try this for just a short period of time, until you were sure to change your perception and application where it comes to the 9 Ki of it. Finally, the traditional Chinese character for Qi is equally adventurous, dynamic and quite meaningful, again not just on account of the intrinsic story told, but once more hinting towards Heaven, Man and Earth as all about the character would be good on your Heart, your blood and blood circulation and your Oxygen. The character just breaths Feng Shui all over, exogenously and endogenously. 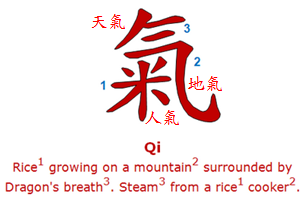 The three top strokes (3) are very dynamic and may in a way be understood as Shui, or water, thereby to denote ever moving mist, vapor, fog, Dragon’s breath or steam coming from a cooker. The body (2) of the character may be taken as a depiction for mountain or a cooker to contain rice and it can be taken for its ability to block or contain energy. Traditionally and for solid reason mǐ, the ideogram for uncoocked rice 米 (1) or whole grains is right at the Heart of the Chinese character for Qi. Ancient societies well understood the equation food equals fate and life was perceived to be good and prosperous if the land duly minded, knowing when to sow, how to appropriately prepare food and otherwise keep to dietary principles that would take into account Yin and Yang, Wuxing, season, gender, latitude, topography and a number of other magnitudes such as which plants (not) to sow in what year, the medicinal use of food and herbs. To say that most of that is in the past would be an understatement and perhaps best reflected by the ideogram for rice having been omitted in the Simplified version of the character which may now read 气 instead, which omission I would say is not just regrettable, but strikes as rather serious, certainly as it may be taken to reflect the characteristic of modern society to go into massive production and consumption of processed foods and radiation. The cycle of transmutation that says ‘the quality of our food produces the quality of our blood, the quality of our blood produces the quality of our organs’ could be extended right up to where we’d once more accepted how ultimately the quality of our blood designates the choices we make and our fate. It is for a reason that the ancients said ‘organs produce emotions’ and this phrase alone should do something for you on account of your understanding organ induced behavior as next time you’d assess the elements in your Bazi horoscope or your 9 Ki birth map. Then again, what has become of metaphysics and the question what is astrology? It depends. If we’re ready to take the original sound out of language, the original mi out of Qi, this much may be clarifying for how we have been treating life readings, Bazi horoscopes, 9 Star Ki birth maps and a thing like organ induced behavior. Again, what in our Qi studies is external and what is internal? In other words, is your astrological sign to depict some sort of external – exogenous – influence, such as perhaps a Chinese animal, one of 9 Stars or a Trigram, or would these be figure of speech and metaphor for organs and your physiology? Anyway, thinking along lines of food energetics and to be once more conjoining Feng Shui, Chinese astrology and our dietary habits would be in accord with Macrobiotics, were it not that most still perceive the system as a way of eating. True, eating would be something we’d do several times a day, so if we cook and eat with Yin and Yang, Wuxing Five Elements in mind, we’d soon say we’re on a Macrobiotic diet, but it is not remotely what the system is about. A thing like economics would become Macrobiotic as soon as the Yin and Yang – the Qi – of it was pulled back in. Same for any imaginable university study that, once the natural principles of our dynamic universe re-installed there, would become Macrobiotic. In the mean time, I hope the ‘not what it seems’ in metaphysics may be instrumental to your going into even deeper scrutinization of those basic tools we have been using in Flying Star Feng Shui, 9 Star Ki or Four Pillars of Destiny, but be only sure to know that there’s no contradiction anywhere.